So what that the iPad doesn’t ship until the end of March? Back in the day (not that long ago, really) I used to travel with a Handspring Visor (a relative of the Palm Pilot) and a physical keyboard that folded up into an amazingly small package about the size of an iPhone (but an inch thick). The combination took up very little space in my backpack and weighed a total of about half a pound. For many years, in fact, the only time I ever wrote in my journal was on airplanes. I’d just whip out the PDA and keyboard and start typing away. I found a similar blog post after Googling a bit. Ken brought to my attention a good article that at first glance falls under the category of Apple Tablet speculation, but is really just a very clear vision of the educational technology that teachers and students want. Ken found out about the article because the author emailed him to point out that many of his requirements could be met by tablet versions of existing Omni software. 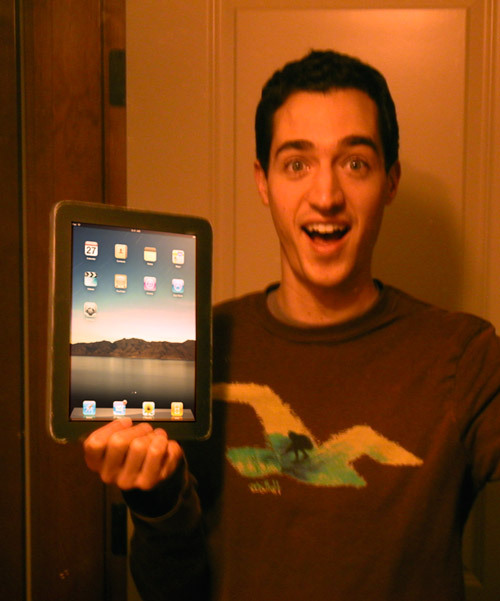 Will the Apple Tablet Support or Hinder Users’ Cognitive Fitness? Learning involves a lot of thinking, writing, drawing and communicating. Learning involves anticipating what the author will say, setting learning objectives, detecting knowledge gaps, writing comments on the document, drawing diagrams. Unfortunately, today’s computers do not make this an easy task. And why not allow users to directly add dictionary entries to their self-testing database, so that they never have to look up the same word twice? Update (August 2010): Inkling, just released, is the first iPad app I’ve seen that begins to incorporate some of these ideas, such as writing comments on the text. When I was in college, a poll sent to faculty members found that only something like 3 out of 200 professors were Republican. The first explanation that came to mind, of course, was that it’s because you have to be reasonably intelligent to be a professor. A gentler explanation is discussed by a recent NY Times article (“Professor Is a Label That Leans to the Left“). It reviews sociological research arguing that because professors are seen as liberal, it’s a career choice that appeals to liberals — thus perpetuating the imbalance. Another reason I thought this was interesting is that I’ve been arguing along these same lines for a long time as applied to the dearth of women in computer science. That is, computer science is seen as a community of nerdy boys, so the people attracted to the field tend to be more nerdy boys, plus those who are attracted to nerdy boys. But I hadn’t quite made it to the logical conclusion that the more we emphasize the lack of women, the more we perpetuate the problem. No wonder the trend has been so difficult to reverse. I’ve been ranting again about how hard it is to deal with images in web applications. I’ve touched on this topic before. It came up again because I wrote a blog post with five or six illustrations inline. It was easy enough to draft the blog post in the Mac desktop environment: I just copy/pasted or dragged the illustrations directly into my rich-text document. When it came time to move this onto the web, however, there was no simple approach I could find. All methods involved individually uploading the illustration images and re-linking to them from within the text of the blog post. Sure, I can do that. But it’s sufficiently annoying to discourage me from using images in blog posts when at all possible. If we are going to start meeting the needs of the half of the population who are primarily visual thinkers, we are going to have to start creating software that makes the web much more friendly towards end-user graphics. For a while now I’ve been wanting to consolidate all of my blog entries into a blog system that runs in my own web space. That way, I can customize the blog as much as I want, I can be confident that I’ll never have to pay extra for it (beyond what I already pay for web hosting), and I can give it a nice url like robinstewart.com/blog/. The only problem was that the process of transferring my old blog entries into the new blog system turned out to be waaaay more time-consuming than I had hoped. That is the moral of this story. But if you’re interested in all the nerdy details, read on. I started writing occasional blog entries back in 2006. I originally used a blog provided through Williams College. Then at some point I switched to a blog hosted by Blogger (but I left the old entries in the old blog). Now that it has become easy to install WordPress on my own website, I did so. But to really make the transition, I had to move all of the blog entries from the two old systems into the new system. How hard could that be? The next step was to import my newer blog entries from Blogger. The new WordPress has an option to do this import directly. You provide your login information and it goes and automatically fetches all of the blog entries. That import went smoothly, but the HTML underlying the blog entries I had created in Blogger were full of extra <div>s so that the entries didn’t render properly alongside normal, clean WordPress-generated blog entries. I considered doing some CSS hacking to make the Blogger entries look ok, but after some experimenting to no avail I decided it would be a lot better to have clean HTML anyway. To achieve that, I ended up exporting from my new WordPress system all of the blog entries that I had by now imported. I opened the resulting XML export file in a text editor, and performed some judicious find-and-replace-all operations to get rid of those extraneous <div> tags (while keeping the important ones). Then, I deleted all of the entries from WordPress and re-imported my edited XML file. Unfortunately, this re-import didn’t quite work (the importer web page just hung indefinitely). But I was eventually able to work around the problem by splitting up the XML file into about five different files, and importing them separately. Finally, all of my old blog posts were in my new system, and in a way that looked fine without CSS hacks. Whew! It may have been faster to retype them all by hand. I finally read Let My People Go Surfing because Bill Buxton told me to. Actually, he told everyone at CHI 2008 during his keynote address. I actually wrote it down and found the reference later — personal information management for the win! In his keynote, I remember Bill saying something like, “it’s a pity about the book’s title.” The author, Yvon Chouinard, is the founder of Patagonia (the outdoor clothing company). Let My People Go Surfing is the name of Patagonia’s employee benefits package, which is not all that exciting. The reason Bill mentioned the book to an auditorium of human-computer interaction professionals is because of its incredibly compelling chapter on product design. Chouinard’s goal is to “make the best products.” But realizing how abstract and useless that phrase is by itself, he delves much deeper and lays out an insightful “philosophy” of product design standards. Below I’ve selected the ones that also apply to software, in my view. It’s always useful to read a well-informed list like this one and try to apply its insights to my own product design work.